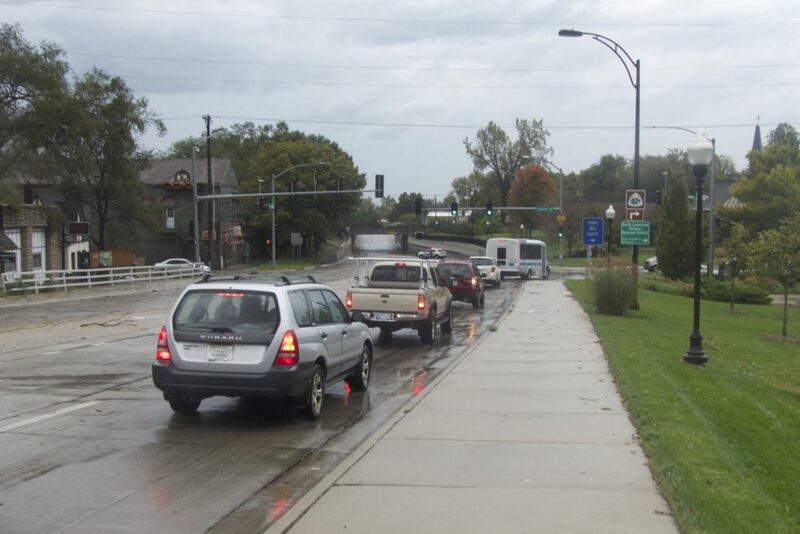 Traffic backs up at about 4:30 p.m. Saturday on North Second Street as Lawrence police block traffic on the street under the Union Pacific Railroad overpass. Jennifer Prieto, a meteorologist with the National Weather Service in Topeka, said about a half-inch of rain fell in less than an hour at Lawrence Municipal Airport as a stormfront blew through the city. The storm also packed 50-75 mph winds, downing multiple tree limbs and power lines in Lawrence, Prieto said. A severe thunderstorm moved through Douglas County Saturday evening, leaving thousands of residents without power. Gina Penzig, Westar Energy media relations manager, said about 3,500 customers lost power in Lawrence because of wind damage, with North Lawrence sustaining the most damage. Penzig estimated power would be restored to all customers by 7 a.m. Sunday. Jennifer Prieto, a meteorologist with the National Weather Service in Topeka, said the destructive winds were not caused by a microburst. Such an event would have caused a loss in wind speed as the storm continued east, but winds stayed at 55 mph in Bonner Springs, she said. Prieto said the storm would start to dissipate as a cold front moved into Lawrence around midnight Sunday. Several Lawrence residents posted about the storm damage on social media Saturday. Goodbye my sweet sweet Ram.